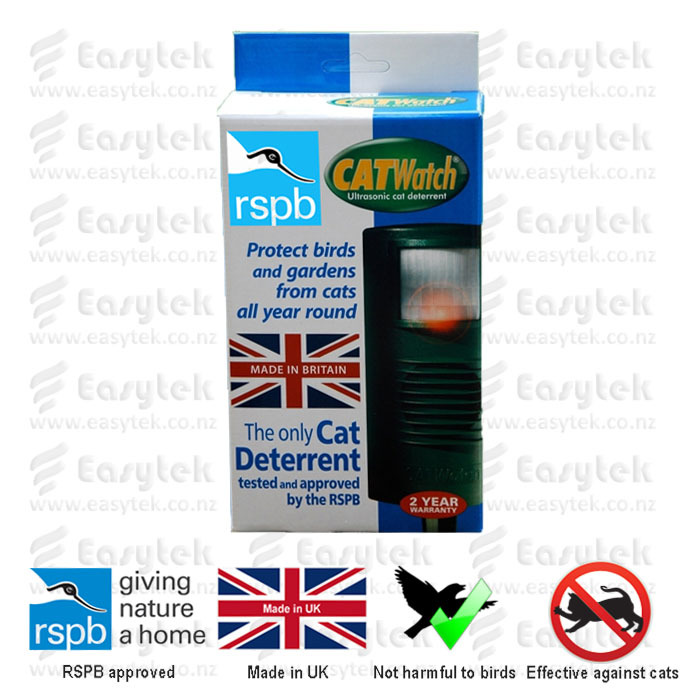 CatWatch® - ultrasonic cat repeller protects birds and gardens from cats all year round. Many people find cat-fouling a nuisance. CatWatch® is proven to reduce the presence of cats in gardens and the deterrent effect increases over time. CatWatch has been tested and approved by the Royal Society for the Protection of Birds (RSPB), the largest nature conservation charity in the UK. The built-in motion sensor detects movement in the protected area. The sensor triggers an ultrasonic burst, which will repeat until the cat leaves the protected area. A red light behind the lens indicates that the CatWatch® unit has been triggered. Unlike many pest repellers that operate continuosly, Catwatch waits for the animal to enter the protected area. Internal sensor detects the crossing of a warm body (e.g. cat). A powerful ultrasonic sound burst startles the animal. The cat learns that he or he is causing the unpleasant occurence to happen every time the cat goes into the protected area and therefore stays away. The cat avoids the protected area in the future. CatWatch® is made of weather-resistant materials and comes with a 2 year manufacturer warranty. What is the CatWatch's range? CatWatch® can sense movement within 40 feet (12 meters) in an 100 degree angle outward from the sensor. 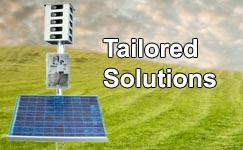 The effective deterrent range is up to 18 meters (60 feet). Does CatWatch® work at day and night time? Yes, CatWatch® protects your area 24/7. The CatWatch's internal motion sensor detects the crossing of a warm body in the field of view. Does CatWatch® work on all cats? CatWatch® works on most cats. Some white cats, cats with hearing damage and some exotic breeds are by nature hard of hearing in the upper frequency hearing and may not be affected. CatWatch® - Large Area Automatic Cat Repeller reviewed by George W., AUCKLAND on 2016-05-25 . CatWatch® - Large Area Automatic Cat Repeller reviewed by Roy P., Wellington on 2016-03-02 . CatWatch® - Large Area Automatic Cat Repeller reviewed by Jean M. Leeston on 2015-09-30 . Purchased our first Catfree couple of months ago in the desperate bid to put a stop to about 7 cats (not ours) pooing in gardens .Over the first 2 months had one use the garden , decided to buy two more units about two weeks ago . One catfree for front garden , and the bigger unit for veg garden .Netting off veg garden removed few days ago so far so good .The front unit has been moved as a cat has found another spot to "go".Hopefully they will all get the message soon .The problem only started after our beagle died . One neighbour with two cats has shingle on his garden so they come here . So far the unit has certainly worked on most cats . Will keep you up to date when the veg fully planned. 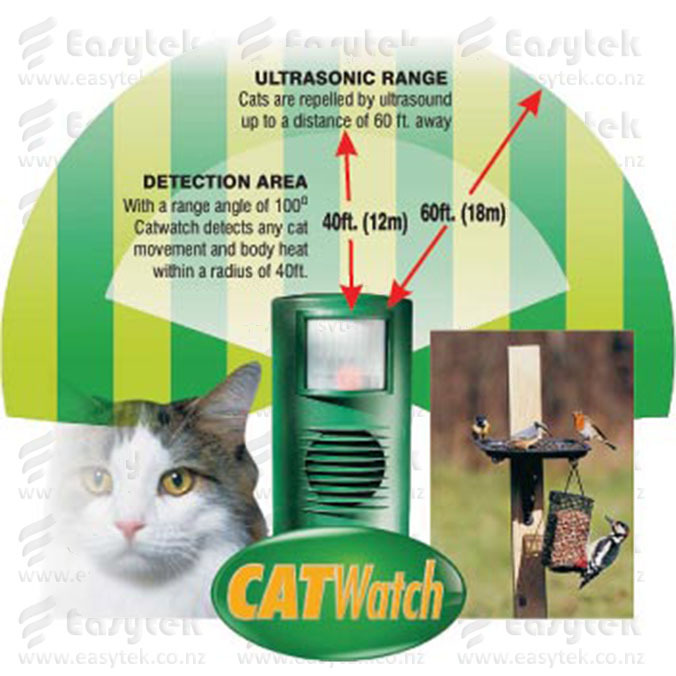 CatWatch® - Large Area Automatic Cat Repeller reviewed by Russel G., Rotorua on 2015-07-22 . CatWatch® - Large Area Automatic Cat Repeller reviewed by Krystle B., Auckland on 2015-04-09 . CatWatch® - Large Area Automatic Cat Repeller reviewed by Mark N. on 2015-02-08 .